Hope for Paws got a text about two dogs living near the freeway. Two volunteers went down to check the situation out. They found mama and her puppy out in the streets. It was easy enough to get a net over the puppy, but when mama saw her puppy in trouble she jumped into action. Luckily some local men who had been feeding the mama dog showed up. She trusted them and came to them. They were able to help get a leash around her neck. Once mama saw that her puppy was alright, they all got in the car and went to see the vet for a checkup. 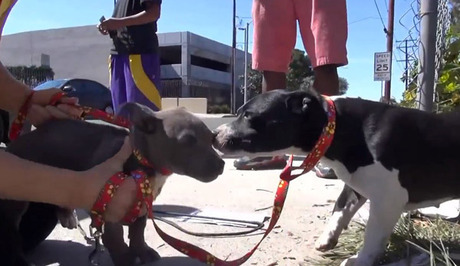 Now the mama, nicknamed Oreo and her puppy, now called Cookie Monster, are looking for homes in the Los Angeles area. You can follow their story on the Hope for Paws Facebook page. Thanks to Hope for Paws! 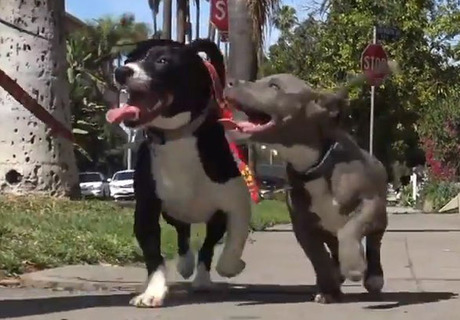 Help Oreo and Cookie Monster find homes by sharing their story on Facebook.